I wanted to put together a short Youtube video with video clips and photographs I took during the last 3 years while working with honeybees. My goal was to bring awareness to people that honeybees are not scary and bee swarms are not Hollywood horror events. I wanted to show people that bees don't sting people unless they are provoked in most cases. I wanted to show people how beautiful the bees are and how important they are to human civilization and survival. For the last 5 months I worked on sorting through the video clips and over 300 photographs. I did online research on history of honeybees and read a couple books on honeybees. Lastly, I spend hundreds of hours putting together the selected video clips, photographs, and sound clips in After Effects 5.5 and showed it several times to my After Effects and Beneficial Beasts in the Garden classes for feedback. The final version of the video is now on Youtube.com. I hope you like it. Last July I had one cherry from the grafted part of the cherry tree. The grafted part has grown quite a bit during the past year. Currently, there are about five cherries on that part of the tree. I am so excited! I will be checking on the tree very regularly for the next few weeks and be sure to eat the cherries when they are ripe. Birds love to steal ripe shiny red cherries. The peach tree is covered with baby peaches right now. It's getting heavy that I am afraid one of the biggest branches might just break off. It's already cracked at the base. After searching through different piles of found objects on the farm, I ended up using a piece of 4x2 on top of an old garbage can to support the cracked branch. It would surely break off if I did not hold it up with something. The apple tree is covered with baby apples as well. Although I don't usually get to see honey bees pollinating my fruit trees, they obviously have been busy visiting all of them hence the fruits. Honey bees are growers' best friends for sure! I decided to plant less snow peas this year since I always had too many in the past years. I also planted them in a smaller patch of area for easier picking. Instead of growing a lot on the arbor or designated an entire wine barrel, I just gave half of a vegetable beds for snow peas this year. I planted the seedlings back in March. For the past week, I have been picking fresh snow peas about every other day. Sometimes I put them in soup and sometimes I sauté them in olive oil. They are super fresh and slightly sweet. You don't need to go to a gym when you have a garden. You can simply put the energy that you are willing to waste in a gym into good use by growing something or clearing something. One of my vegetable beds had been overgrown with radish, broccoli DeCicco, and various weeds. The flowers have been attracting a lot of bees, so I sort of just let them grow out of control. Now the flowers were welting, I decided it was time to clear out the bed for new plants. I cut back most of the vegetation before pulling them out from the roots. After it was all cleared out. 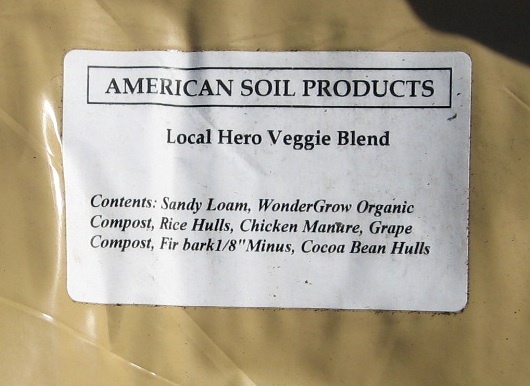 I dragged two 2-cubic-foot bags of Local Hero Veggie Blend over to the vegetable bed and slowly added them in as I turned and mixed the soil with Dusty's poop. It had been a very warm day, so I was covered in sweat as I worked as quickly as I could. Kelsey was waiting for me to take her out for a walk! After I got the soil all mixed together, I planted some of the New Zealand spinach seedlings that have been sitting on my propagation table. One last step was to water all the newly planted (including yesterday's) plants really well. In the next few days, I will fill up the new space with other edibles. Today was the last day of Merritt College's annual spring plant sale. While I could easily grow just about any plant in the green house while being a horticulture student on campus, I wanted to support the college by purchasing some plants at the plant sale. I wasn't really sure what I was looking for, but it didn't take long to find a few new additions to Sand Village Farm. Back in 2010, I had a new arbor built, and I have been thinking about what to grow on the arbor. The passion fruit is doing great right now, but it would be nice to have something else edible hanging down the arbor. As a Californian, the choice is obvious - grape! They have many different varieties of grape at the plant sale. For me, it was either the golden grape or dark purple grape because I didn't really know the difference. I ended up taking a Glenora grape, which is a Concord type grape. They are dark purple, juicy, seedless, cold hardy, heat tolerant, and disease-resistant. It sounds too good to be true. During the last couple years, I "discovered" a new fruit called gooseberry (Physalis peruviana) while being a horticulture student. I don't remember ever seeing gooseberries in stores, but there are a few gooseberry plants on campus. Every once in a while, if I am lucky, I can pick a few off the plant. They are very tasty. I bought a few cape gooseberry seedlings and a 2-inch golden ground cherry. They are basically the same thing. I might keep 2 of them in a pot so I can keep it indoors during the winter. I replanted some broccoli DeCicco from some of the self-germinated seedlings. With plenty of sun, water, and good soil, they grew fast. I have been wanting a big plate of sauteed broccoli leaves for a while. Broccoli DeCicco is different from regular broccoli in the sense that they stay small, and everything is edible. Tonight I cut off a bunch of big green leaves and chop them up into smaller pieces. I sautéed some oyster mushrooms in olive oil and then added the broccoli leaves. After everything is cooked through, I added some bean curd just because I happened to pick up some last night. Instead of adding any seasoning, I put in two table spoons of Trader Joe's green olive tapenade just because I like it, and I know it's salty enough to season the veggies. I put everything over a plate of steamed rice. That was a pretty good dinner.